Volvo’s new autonomous electric commercial vehicles ... their propulsion is entirely electric with zero exhaust emissions and low noise levels. Designed for repetitive transport jobs involving high precision between fixed hubs, as a complement to today’s solutions, the solution consists of autonomous, connected, electric vehicles and a transport control centre. The vehicles, whose propulsion is entirely electric with zero exhaust emissions and low noise levels, are used as tractor units and are compatible with existing load carriers/trailers. 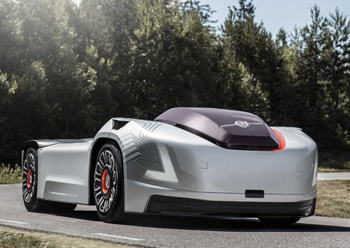 Volvo’s autonomous vehicles ... designed for a safer and cleaner future. These vehicles are designed to tackle the significant environmental challenges such as congestion, pollution and noise caused by the growing world population and increasing urbanisation. Also, rising consumption, the fast growth of e-commerce and the widespread shortage of drivers put higher demands on efficient transport solutions, says a company official. “The full potential of the transport industry is yet to be seen. Everything suggests that the global need for transportation will continue to significantly increase in the coming decade. If we are to meet this demand in a sustainable and efficient way, we must find new solutions,” says Claes Nilsson, president of Volvo Trucks. “In order to secure a smoothly functioning goods flow system, we also need to exploit existing infrastructure better than we are doing currently. The transport system we are developing can be an important complement to today’s solutions and can help meet many of the challenges faced by society, transport companies and transport buyers,” he adds. 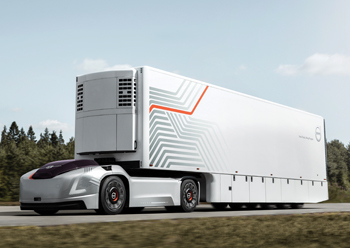 Volvo Trucks’ future transport solution is intended to be used for regular and repetitive tasks characterised by relatively short distances, large volumes of goods and high delivery precision. Transport between logistic hubs are typical examples, but additional use cases can also be applicable. “Our system can be seen as an extension of the advanced logistics solutions that many industries already apply today. Since we use autonomous vehicles with no exhaust emissions and low noise, their operation can take place at any time of day or night. The solution utilises existing road infrastructure and load carriers, making it easier to recoup costs and allowing for integration with existing operations,” explains Mikael Karlsson, vice-president Autonomous Solutions. A transport control centre and cloud service handle the operation of the vehicles, which are equipped with sophisticated systems for autonomous driving. The vehicles are designed to pinpoint their current location to within centimetres, monitor in detail and analyse what is happening with other road users, and then respond with high accuracy. The transport control centre continuously monitors the progress of the transport and keeps an accurate watch of each vehicle’s position, the charge of the batteries, load content, service requirements and a number of other parameters. As with an industrial production process, speed and progress are tailored to avoid unnecessary waiting and to increase delivery precision. In this way, it will be possible to minimise waste in the form of buffer stocks, and increase availability. Vehicles that operate on the same route cooperate to create optimal flow. In the near future, Volvo Trucks’ transport solution will be further developed together with selected customers in prioritised applications, the company says.